Behind the Bit: Hermes scrubbing brush: What does one do with this? 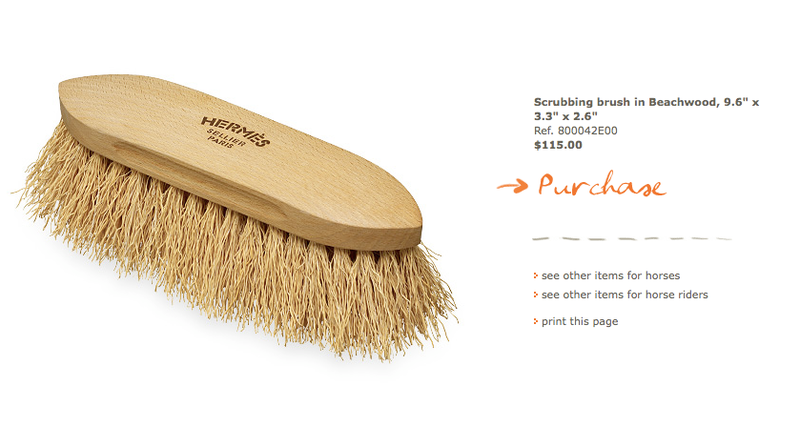 Hermes scrubbing brush: What does one do with this? One look at the price ($115), and I'm not likely to use it on my horse. It doesn't exactly go on the mantle, either. As lovely as I'm sure it is, who goes to Hermes and buys something practical? I'm notorious for misplacing things around the barn, but that is one brush I'd never lose. If you got this as a gift, would you use it??? Your guess is as good as mine..hmm? It looks like harsh broom bristles. Maybe for cleaning around the barn? But even then $115???? Whoa.. I used to have that brush (but without the pricetag - mine was a fancy gift but that's just nuts) and used it like a broom! Deep seated dust came right out, and the horses adored it. I used to have one when i showed English and Jumping. We used it on our saddle pads, and and our show blankets. When i had it it was $55, i dont know why their has been such an increase! I would be afraid to use it! What the....oh my. I would likely use it to brush my horse with but only if I did not pay for it. Think about all the other useful things for 115$ you could buy. Like 20 of these brushes of a very similar make. I'd return it and buy several things I could use!! I'm just sitting here thinking it would be nice to actually have the money to burn on something like that. Yes, I would use it because I don't believe in keeping things if I don't use them. That being said, I'd never buy the thing. Ridiculous! I would never spend that much myself on a BRUSH! Much rather get my horse something practical like you said. If I got it as a gift, it would sit in the fancy trunk along with all the other brand new shiney things I bought as backups so I don't have to feel so bad about their working counterparts loosing their luster. My horse has his stuff, and I have a second set just to admire. I'd use it and probably lose it in the barn somewhere....IF it was a gift and IF I really had no idea how much it cost--which is only proper with a real gift. Sure, I'd use it on the horses if I received it as a gift. They love those nice stiff bristles and it works great. However I paid only $15 for mine! Dogs also enjoy it.